GallopNYC uses therapeutic horsemanship to help riders in NYC with disabilities walk, talk and learn,inspiring them to live their lives as fully, independently and productively as possible. GallopNYC's vision is that every child with a disability in New York City has access to therapeutic horseback riding. Side Walking: Assist the instructor during therapeutic riding sessions by working directly with the riders. Act as an intermediary between the rider and instructor by assisting the rider in carrying out the instructor’s directions. Check out our Volunteer page to learn more about the program, and how volunteers help with lessons. 1. Go to: https://volunteer.gallopny c.org/HOC__Volunteer_Registrat ion_Page, and make an account. 2. Complete the online orientation. After you sign up on the website, you will receive further updates on how to complete your registration. That’s it! *Experience with horses is helpful but not at all necessary. 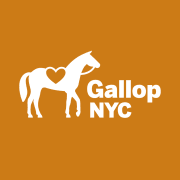 Please feel free to contact us for more info at volunteer@gallopnyc.org. Online orientation must be completed.